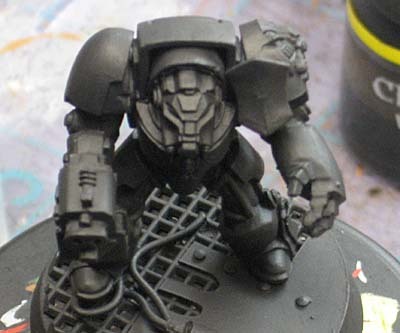 Today we're going to be painting a Space Marine Terminator. I chose an Ultramarine because these guys are "40k." I'm going to paint him by sticking to simple techniques like base coating, washing and highlighting. Nothing fancy like wet blending or any other "advanced" techniques. I did add some simple, and I mean real simple freehand into this one because I didn't want to get into adding decals. I know you all can do it too. If you can line highlight, you can do simple freehand work. So we start with our model. I built the base for him to tie into the science fiction theme this week. Taking a few minutes before you start your army to think about your basing can have a huge impact on the finished look of your force. Putting him on a Space Hulk seemed to be the perfect fit with this week's theme. Since we're focusing on painting here, I won't go into the construction of the base. I will cover the painting of it at the end of the post though. We start this model by priming him black. The blues we are using are fairly opaque and we don't really have to worry about the blue changing color when it goes over the black as opposed to being painted over white. Starting with black once again gives us all of our shadows and helps "hide" any of our smaller mistakes. The first step is to get our smaller, interior elements done. In this case, it's his eyes, the flex fitting between his joints and all the metal areas. We paint these smaller areas first so that we're not stuck trying to do them after we've got our basecoat with it's shading and highlighting done and we're worried about ruining it with any stray marks. Make a mistake at this point and you can clean it up with some black paint without any worries. Painting helmet lenses tutorial can be found here. Flex fitting painting is covered in this tutorial here. With the interior elements out of the way, we move onto the big part of this model and that's the basecoat. I started with GW Regal Blue followed by a wash of Asuremen Blue painted only in the recessed areas and ended with a line highlight of GW Ultramarine Blue along the edges. TRICK: By applying your shading wash into the recessed areas of the model only, you can control it's application better and clean up any mistakes with the original base color. It gives you a cleaner, more finished look to the model in the end as opposed to just applying the wash to the entire model. 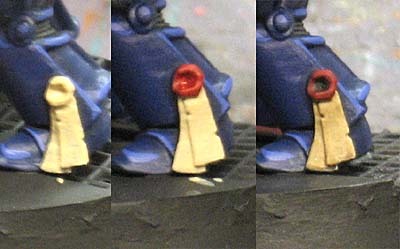 And the same goes for your highlight... make a stray mark and you can clean it up with your basecoat. Now we move onto the outside elements. We've painted the inside things like eyes and such, did our basecoat, now we start with the things that are on top of the armour. Since this guy is a Veteran, his helmet is white. I decided to use the same technique on the crux on his left shoulderpad, his chest piece and the iconography on his right greave. Because we primed him black, we'll need to work up to white with a couple steps to make everything nice and smooth. I start with a dark grey and paint the whole area that will be white in the end. No need to leave any black showing. After that, I go in with a very light grey and paint the portions again, leaving a small amount of the dark grey showing in the recessed areas. Then you repeat the same thing over again using white. Notice how we had to paint around the eyes since they were finished earlier. Painting around them is much easier than tying to paint inside them after we have our nice white helmet done. I also went in and line highlighted to black areas on the model (his storm bolter case and powerglove fingers) when I was painting the first dark grey layer. TRICK: By working up through a layer of dark grey and then light grey up to white, you don't need a hundred coats of the white to make it smooth and opaque. Since there are some smaller decorative elements on the model, I decided to make them stand out by painting them gold. I start by painting the area with a rich, warm brown color that is close to the gold I want in the end, but slightly darker. Then it's just a matter of highlighting with the gold of your choice. You'll notice I did not "pre-paint" the ammo feed with the brown color. With small things like that, I find it just the same to paint the gold right over the black. The results are the same. TRICK: By painting your metallic areas with a similar shade of a regular color first, you accomplish a few things. One, if you miss a spot with your metallic paint, it's not obvious. Two, it cuts down on the number of coats of metallic paint you may need for a smooth finish. And three, if you just highlight with the metallic color, when you apply a wash to the finished area, your recessed areas will be a bit darker since washes behave differently over regular paint than metallic paint. And the one purity seal he has. I start with a light tan base color and paint the whole thing. By painting the area that will be red, I give it a lighter base color to start with so the red does not require a half dozen coats. It just saves time. A quick wash with GW Devlan Mud and this part is finished. Ok, now for some simple freehand. Take a deep breath, you can do this. It's not hard if you break the shape down into smaller, simpler pieces and then reassemble it in stages. The Ultramarine symbol. By itself, it can be a formidable icon to paint if you try to do it in one pass. Break it down into lines and it's easy as can be. For this, I used the same light grey that I used when I was painting his helmet. It's almost white, but not quite. 1. Start by painting a cross in the middle of the shoulderpad. 2. Use the cross as a guide to paint a circle. There's no need to guess and try to get it perfectly round, that's why you have the cross there. With your first circle done, paint another one just outside of it and slightly lower on the bottom edge. Then fill in between the two circles, you can see where I've already started to do it on the right side. 3. Fill in your space completely and add a straight line across the top of your icon. 4. Draw two triangles, one on each and of the straight line you just drew. 5. Finally, fill in your triangles. Then it's a matter of taking your basecoat (GW Regal Blue) and going in and painting over the original cross you started with. TRICK: Thin your paints a little bit when doing this. It will help you get smooth lines and make it easy to cover up any mistakes. If you don't, you may end up with some subtle surface texture that is hard to hide and you'll be able to tell you tried to cover something up. You don't need to thin them down to nothing, just a little bit so that you don't create any surface texture. And one last piece that adds some real detail and is simple to do. 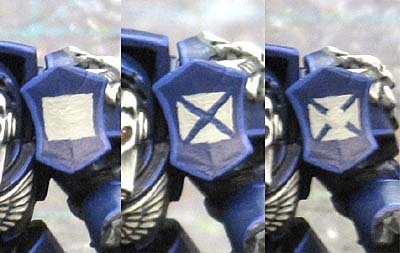 Using the same light grey color, paint a square on his combat shield. Once you have your square done, paint an "X" over it with your base color. Finally, add a small dot of the light grey in the middle to complete the terminator honors shape. The finished model with the base. The base is easy enough to do as well. Since it's already black, a quick coat of any gunmetal color will work. After that, I went back in and painted both cables black. One cable was then painted red and the other yellow (both with GW foundation colors, but anything will work). The yellow cable was then striped with black paint to give it that pattern. The whole thing was given a liberal wash of GW Devlan Mud and Badab Black to give it that weathered Space Hulk feel. With everything dry, I cleaned up the base edge with black so it didn't stand out. Hopefully this has helped with showing you all that a model can be painted quick, given just a bit of detail (easily) and look pretty good in the end. Make sure to check out Dave's science fiction model for this week. 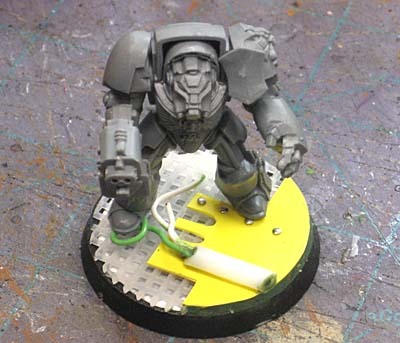 He's tackled a Grey Knight terminator which can be a very intimidating model for some folks. Sometimes people fear a model with lots of detail thinking it will be so hard to paint. Comments and questions welcome, but please keep in mind this model was kept simple and I didn't cover a number of things that can get complicated... it's just the basics. Check out the entire Back to Basics Series here. I've always admired how you do the seemingly intricate free-hand symbol painting by building it up from smaller, simpler shapes and stages. Very nice tutorial there Ron: the back to basics series is great. Nice tutorial. Gonna use it definetly. What did you use for the mesh grill on the base? I presume it's a sheet of something but can't place it. Agreed. The back to basics series has been great! Love what you've done there... I'm still trying to get the freehand stuff down myself as well. Also I'm wondering how you get the cross stitch mesh to stick to the bases. I've tried it before and all that would happen is it would pull off after the PVA or Super Glue dried. Love the free hand tutorial! Looking great Ron! I'm still too intimidated to give the freehand a shot, worried about ruining my nicely shaded armor! Do you have a simple guide like the ones above for doing any Blood Angels markings? I know you said you weren't going to cover the base, but how do you attach the mesh to the plastic base? I've bought the mesh at micheal's that is for stitchwork or something. And I've tried superglue and citadel plastic glue without success. It won't stick to the mesh. Did you use some sort of putty? Thanks folks, I'm glad the series is helping. I love all the questions too. Sometimes I forget that not everyone knows all the little tricks I use. I was worried the freehand would be met with a little resistance since it's technically not "basic." As for the freehanding, I'll be doing a post in the coming weeks about making all kinds of simple shapes. How to take the complex stuff and break it down into simple lines and shapes and put it back together. As for the base. The mesh comes from a craft store and is for knitting or needlework of some kind. Just like everyone else... I cut it to fit on the base and glued it down. But as most of you quickly learn... it tends to pop off easily. Before you glue the mesh down, you glue a piece of regular paper to the top of your base. I just cut out a round piece of scrap paper and superglue it down to the top of the base. Then superglue the mesh on top of that. The mesh will stick to the paper without any problems and shouldn't peel up. Excellent tutorial Ron. I like the addition of the simple freehanding and the extra detail for his base. this is super useful to someone who is still building on basic skills! Thanks a million. Thanks Dave G: Hopefully I'll do as well as you when it comes time for me to paint my Grey Knight. Midas: Glad it helps out. Very nice tutorial and model Ron. 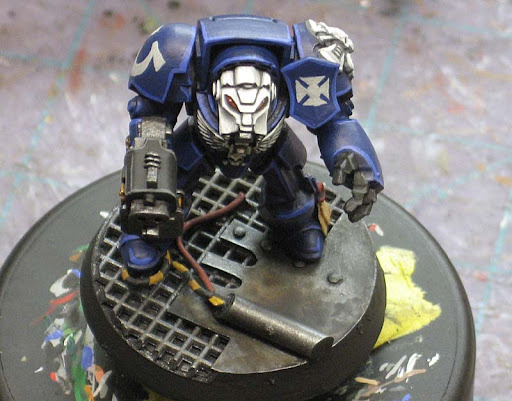 You use more or less the same blue technique than the ones I use to paint the shoulderpads but yours look cleanest. 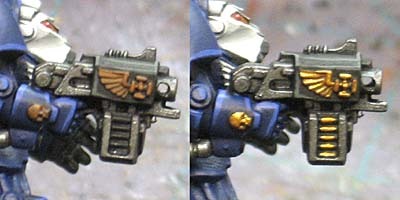 That terminator head is very nice consider that you don't used blending! I'm a really, really big fan of keeping miniature painting simple and posts like this are an absolutely golden resource. 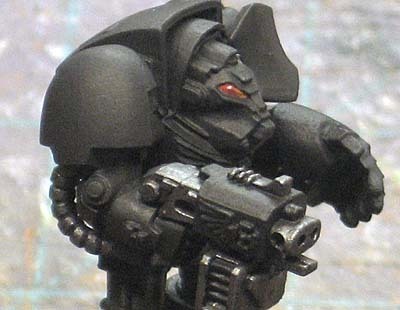 Ron, are you painting up a Grey Knight for the metallics section, or are you just planning on painting one in the future? 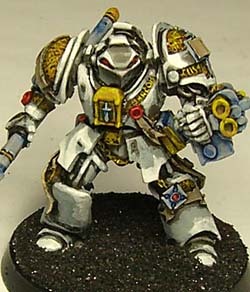 While I love Dave G's (and I'm going to link it on my blog), I would really like to see a metallic approach to the Grey Knight, too. Aiwass: Thanks, it just takes some time to get the white smooth and clean. If you can do that, you don't always need the fancy blending. Admiral: There's something about nice, clean looking models on the table. Michael Hogan: I will indeed be painting one up for the metallics post in a few weeks. Ron, could you supplement Mordian Blue for Asurmen? I lost a bet playing against some Orks and now I've an Ultramarine Stormraven to do. I was thinking about priming it black with a spray paint too. Any suggestions? Jacob: Asurmen Blue is the old GW wash. You can use the new GW shade Drakenhof Nightshade to do the same thing. As far as spray paint, I use the cheapest stuff I can find. The trick is making sure you apply it correctly. Check this priming post out. Some really great advice here and well catalogued, will be suing these tips for sure. Anon: Thanks. The cataloging part has been the hardest aspect of all honestly.